Microsoft Deployment Toolkit (MDT) 2013 provides technology for deploying Windows operating systems, and Microsoft Office. This quick start guide helps you quickly evaluate MDT 2013 by providing condensed, step-by-step instructions for using it to install the Windows 8.1 operating system and Microsoft Office Professional Plus 2010 with User-Driven Installation (UDI) and Microsoft System Center 2012 R2 Configuration Manager. This quick start guide demonstrates how to perform the MDT New Computer deployment scenario, which covers the deployment of Windows 8.1 to a new computer. This scenario assumes that there is no user data or profile to preserve. The infrastructure setup described here is for evaluation purposes and not intended for a production system. UDI installations using System Center 2012 R2 Configuration Manager have the following prerequisites. The Task Sequencer used in MDT deployments requires that the Create Global Object right be assigned to credentials used to access and run the Deployment Workbench and the deployment process. This right is normally available to accounts with Administrator-level permissions (unless explicitly removed). Also, the Specialized Security – Limited Functionality (SSLF) security profile removes the Create Global Object right and should not be applied to computers deployed using MDT. To complete this guide, set up the computers listed in Table 1. These computers can be either physical computers or virtual machines (VMs) with the system resources designated. - A disk partition that has 40 GB or more of available disk space; it will become partition E.
This guide assumes that MDT is being evaluated on 64-bit (x64) physical or virtual computers. If evaluating MDT on 32-bit (x86) platforms, download and install the x86 editions of MDT and the components that this guide describes. For purposes of this guide, all the prerequisite infrastructure services run on the computer named WDG-MDT-01. Install the prerequisite software, server roles, and services on this computer before installing MDT. Use the information in 2 to install Windows Server 2008 R2. Accept default values unless otherwise specified. The MDT deployment process requires additional folders that are used as the source for files or to store files created during the MDT deployment process. Some of these folders need to be shared so that they can be accessed from other computers. Copy the device drivers for the reference computer (WDG-REF-01) and the target computer (WDG-CLI-01) to E:\Source$\Drivers. The processes in this guide assume that the reference computer and target computer have the same devices and do not require different devices drivers. Besides Windows Server 2008 R2, Windows 8.1, and System Center 2012 R2 Configuration Manager, certain software is required to evaluate MDT based on the processes in this guide. Table 4 lists the software required to perform deployments using MDT, where to obtain the software, and where to place the software on WDG-MDT-01. AD DS is required to provide authentication and act as a repository for configuration values for the Microsoft products and technologies that MDT uses, such as Microsoft SQL Server and Configuration Manager. To install AD DS, run the DCPROMO Wizard to configure the computer as a domain controller. Install AD DS using the information in Table 5, accepting any defaults unless otherwise specified. For the domain type Create a new domain in a new forest. For the fully qualified domain name Type mdt2013.corp.woodgrovebank.com. For the forest functional level Select Windows Server 2008 R2. To install the DNS Server service as part of the domain controller installation process Click Yes. The DHCP Server server role is required to provide automatic IP configuration for the target computers. Install DHCP Server using the information in Table 6, accepting any defaults unless otherwise specified. If you are using a virtualized environment, disable any DHCP configuration that the computer-virtualization software provides. Ensure that the DHCP Server service running WDG-MDT-01 is the only provider of IP configuration using DHCP. Authorize DHCP server in Active Directory Authorize WDG-MDT-01 to provide client IP configuration. DHCP scopes Create an appropriate scope that can be used to automatically configure TCP/IP for WDG-REF-01 and WDG-CLI-01. DHCPv6 stateless mode configuration Disable DHCPv6 stateless mode for this server. Install the Web Services (IIS) server role with the role services listed in Table 7, which are required for SQL Server 2008 R2 and Configuration Manager. Unless otherwise specified, use the default values. Configuration Manager and SQL Server 2008 R2 require user accounts during the installation process. Table 8 lists the information needed for creating these accounts. SQL Server Agent service account 1. In First name, type SQL Agent. 2. In Last name, type Service Account. 3. In User logon name, type SQLAgent. 4. In Password and Confirm password, type P@ssw0rd. 5. Clear the User must change password at next logon check box. 6. Select the Password never expires check box. 7. Make the account a member of the Domain Admins security group. 8. In Description, type Service account used to run SQL Server 2008 R2 Agent service. SQL Server Database Engine service account 1. In First name, type SQL DB Engine. 3. In User logon name, type SQLDBEngine. 8. In Description, type Service account used to run SQL Server 2008 R2 database engine. SQL Server Reporting Services service account 1. In First name, type SQL Reporting. 3. In User logon name, type SQLReport. 8. In Description, type Service account used to run SQL Server 2008 R2 reporting services. System Center Configuration Manager Client Network Access account 1. In First name, type CM 2012. 2. In Last name, type Client Network Access. 3. In User logon name, type CMNetAccess. 7. In Description, type Service account used as the network access account for Configuration Manager Client. Before installing Configuration Manager, install SQL Server 2008 R2 SP1 and CU6. To enable all SQL Server 2008 R2 features, install the Web Services (IIS) server role before installing SQL Server 2008 R2. Start the SQL Server Installation Center. In the SQL Server Installation Center, in the navigation pane, click Installation. In the preview pane, click New installation or add features to an existing installation. SQL Server 2008 R2 Setup Wizard starts. Install SQL Server 2008 R2 using the information in Table 9, accepting the defaults unless otherwise specified. Setup Support Rules Click OK.
License Terms Select the I accept the license terms check box, and then click Next. Setup Support Files Click Install. Setup Support Rules Ensure that no critical results exist for the rules, and then click Next. Setup Role Click SQL Server Feature Installation, and then click Next. Feature Selection 1. Select the Database Engine Services check box. 2. Select the Reporting Services check box. 3. Select the Full-Text Search check box. 4. Select the Management Tools - Complete check box. Disk Space Requirements Click Next. Server Configuration 1. For SQL Server Agent, in Account Name, type MDT2013\SQLAgent, in Password, type P@ssw0rd. 2. For SQL Server Database Engine, in Account Name, type MDT2013\SQLDBEngine, in Password, type P@ssw0rd. 3. For SQL Server Reporting Services, in Account Name, type MDT2013\SQLReport, in Password, type P@ssw0rd. Database Engine Configuration Click Add Current User, and then click Next. Reporting Services Configuration Click Next. Installation Configuration Rules Click Next. Ready to Install Click Install. In Windows Explorer, go to E:\Source$\SQL2008R2SP1, and double-click SQLServer2008R2SP1-KB2528583-x64-ENU.exe. The Extracting Files dialog box displays the file-extraction process. When the process is complete, the SQL Server 2008 R2 Service Pack 1 Update Setup Wizard starts. Install SQL Server 2008 R2 SP1 using the information in Table 10, accepting the defaults unless otherwise specified. SQL Server 2008 R2 update Click Next. Check Files In Use Click Next. Ready to update Click Update. Update Progress The progress is displayed on the wizard page as the update is performed and finishes. In Windows Explorer, go to E:\Source$\SQL2008R2SP1CU6, and double-click 446622_intl_x64_zip.exe. The Microsoft Self-Extractor dialog box appears. In the Microsoft Self-Extractor dialog box, click Continue. In the Microsoft Self-Extractor dialog box, in Select the folder where you want to unzip the files to, type E:\Source$\SQL2008R2SP1CU6, and then click OK.
You can click the ellipse (…) to browse for the E:\Source$\SQL2008R2SP1CU6 folder. The extraction process is displayed. When the process is complete, the completion status is displayed. In the Microsoft Self-Extractor dialog box, click OK. In Windows Explorer, go to E:\Source$\SQL2008R2SP1CU6, and double-click SQLServer2008R2- KB2679367-x64.exe. The Extracting Files dialog box displays the file-extraction process. When the process is complete, the SQL Server 2008 R2 Service Pack 1 CU6 Update Setup Wizard starts. Install SQL Server 2008 R2 SP1 CU6 using the information in Table 11, accepting the defaults unless otherwise specified. The Install a SQL Server 2008 R2 update dialog box appears prompting you to restart the computer to complete the setup. In the Install a SQL Server 2008 R2 update dialog box, click OK.
After installing SQL Server 2008 R2 SP1 CU6, the SQL Server build number should be 10.51.2811.0. You can verify the SQL Server build number by viewing the SQL Server updates applied in the Programs and Features Control Panel item by clicking View installed updates. When all computers are in the same forest, manually add the site server computer account to the local Administrators group on each computer. Complete this step before configuring the computer as a site system. In the Active Directory Users and Computers console tree, go to mdt2013.corp.woodgrovebank.com/Builtin. In the preview pane, right-click Administrators, and then click Properties. In the Administrators Properties dialog box, click the Members tab, and then click Add. In the Select Users, Contacts, Computers, or Groups dialog box, click Object Types. In the Object Types dialog box, in Object types, select Computers, and then click OK. In the Select Users, Contacts, Computers, or Groups dialog box, in Enter the object names to select, type WDG-MDT-01. Click Check Names, and then click OK. When the other products and technologies have been installed, install Configuration Manager. Before doing so, however, extend the Active Directory schema so that computers can locate the distribution points, service locator points, and other server roles. Also, you can extend the schema after you have installed Configuration Manager. For more information about how to extend the Active Directory schema for Configuration Manager, see the section, “Extend the Active Directory Schema,” in the Configuration Manager Documentation Library, which is installed with Configuration Manager. After extending the Active Directory schema, install Configuration Manager. The configuration of WDG-MDT-01 supports Configuration Manager for this sample. The configuration of computers in the production network may vary. To find out more about the prerequisites for installing Configuration Manager, see Supported Configurations for Configuration Manager. Start the System Center 2012 R2 Configuration Manager Setup splash screen. On the System Center 2012 R2 Configuration Manager Setup splash screen, click the Install link. The Microsoft System Center 2012 R2 Configuration Manager Setup Wizard starts. Complete the Microsoft System Center 2012 R2 Configuration Manager Setup Wizard using the information in Table 12. Accept the defaults unless otherwise specified. Before You Begin Click Next. Product Key In Enter your 25-character product key, type product_key (where product_key is your product key for Configuration Manager). Microsoft Software License Terms Select the I accept these license terms check box, and then click Next. Update Prerequisite Components In Download and use the latest updates. Updates will be saved to the following location, type E:\CMDownloads, and then click Next. Server Language Selection Click Next. Client Language Selection Click Next. Site and Installation Settings 1. In Site code, type NYC. 2. In Site name, type New York City Site. Primary Site Installation 1. Click Install the primary site as a stand-alone site. The Configuration Manager dialog box appears, confirming that you want to install this site as a stand-alone site. 3. In the Configuration Manager dialog box, click Yes. SMS Provider Settings Click Next. Client Computer Communication Settings Click Configure the communication method on each site system role, and then click Next. Site System Roles Click Next. Customer Experience Improvement Program Configuration Select the appropriate participation in the Customer Experience Improvement program for your organization, and then click Next. Prerequisite Check Click Begin Install. Install Monitor the installation process until it is complete, and then click Close. When the wizard is complete, Configuration Manager is installed. The Configuration Manager client needs an account to provide credentials when accessing the Configuration Manager distribution points, MDT deployment shares, and shared folders. This account is called the Network Access account. The CMNetAccess account was created earlier in the process to use as the Network Access account. Click Start, point to All Programs, and then point to Microsoft System Center 2012. Point to Configuration Manager, and then click Configuration Manager Console. In the Configuration Manager console, in the navigation pane, click Administration. In the Administration workspace, go to Overview/Site Configuration/Sites. In the preview pane, click NYC - New York City Site. On the Ribbon, click Settings, click Configure Site Components, and then click Software Distribution. In the Software Distribution Properties dialog box, click the Network Access Account tab. In Network Access Account, click Specify the account that accessed network locations, click Set, and then click New Account. The Windows User Account dialog box appears. Complete the Windows User Account dialog box using the information in Table 13, and then click OK. In the Software Distribution Properties dialog box, click OK. The Configuration Manager client needs to know the boundaries for the site. Unless the site boundaries are specified, the client assumes that the computer running Configuration Manager is in a remote site. Add a site boundary based on the IP subnet that WDG-MDT-01, WDG-REF-01, and WDG-CLI-01 use. Then, add the site boundary to a site boundary group. Click Start, point to All Programs, and then point to Microsoft System Center 2012. Point to Configuration Manager, and then click Configuration Manger Console. 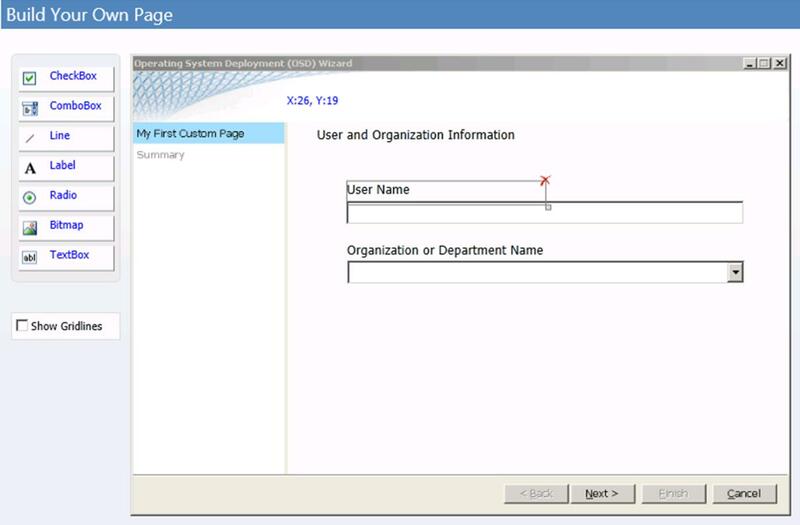 In the Administration workspace, go to Overview/Hierarchy Configuration/Boundaries. On the Ribbon, click Create Boundary. The Create Boundary dialog box opens. Complete the Create Boundary dialog box using the information in Table 14, and then click OK.
For this sample, the site boundary is specified by network address. However, you can also specify site boundaries using an AD DS site name or an IP address range. Description Type IP Subnet Boundary. Network Type network_address (where network_address is the network address of the subnet where the computers are installed). Subnet mask Type subnet_mask (where subnet_mask is the subnet mask of the subnet where the computers are installed). In the Administration workspace, go to Overview/Hierarchy Configuration/Boundary Groups. On the Ribbon, click Create Boundary Group. The Create Boundary Group dialog box opens. Complete the General tab of the Create Boundary Group dialog box using the information in Table 15. Name Type New York City Boundary Group. Description Type Boundary group for the site boundaries at the New York City site. The Add Boundaries dialog box appears. 2. In the Add Boundaries dialog box, select site_boundary (where site_boundary is the site boundary you created earlier in the process), and then click OK. The site boundary appears in the list of boundaries. Complete the References tab of the Create Boundary Group dialog box using the information in Table 16, and then click OK.
Site assignment Select the Use this boundary group for site assignment check box. Content location 1. Click Add. The Add Site Systems dialog box appears. 2. In the Add Site Systems dialog box, select \\WDG-MDT-01.mdt2013.corp.woodgrovebank.com, and then click OK. The site system server appears in the list of site system servers. The Configuration Manager client needs to locate the various Configuration Manager server roles. Modify the site properties to publish the site information in AD DS and in DNS. On the Ribbon, click Properties. In the New York City Site Properties dialog box, on the Publishing tab, verify that the mdt2013.corp.woodgrovebank.com Active Directory forest is listed, and then click Cancel. In some instances, software will be deployed to user collections that Configuration Manager discovers. Configuration Manager can discovery user accounts stored in AD DS using the Active Directory User Discovery method. In the Administration workspace, go to Overview/Hierarchy/Discovery Methods. In the preview pane, click Active Directory User Discovery. On the Ribbon, on the Home tab, click Properties. The Active Directory User Discovery Properties dialog box appears. Select the Enable Active Directory User Discovery check box. In Active Directory containers, click New. The New Active Directory Container dialog box appears. In the New Active Directory Container dialog box, in Path, click Browse. The Select New Container dialog box appears. In the Select New Container dialog box, click mdt2013, and then click OK. In the New Active Directory Container dialog box, the Lightweight Directory Access Protocol (LDAP) path is displayed in the Path box. In the New Active Directory Container dialog box, click OK. The LDAP path appears in the Active Directory containers list box. In the Active Directory User Discovery Properties dialog box, click OK. The Configuration Manager dialog box appears, querying whether you want to perform the discovery as soon as possible. In the Configuration Manager dialog box, click Yes. In the Configuration Manager console, in the navigation pane, click Assets and Compliance. In the Assets and Compliance workspace, go to Overview/Users. The list of users discovered in AD DS is displayed in the preview pane. The first step in the deployment process is to prepare the MDT environment. When this step is complete, you can create the reference computer and deploy a captured image of it to the target computer (WDG-CLI-01) using Configuration Manager integration with MDT. In Windows Explorer, go to E:\Source$\MDT_2013. Complete the Microsoft Deployment Toolkit 2013 Setup Wizard using the information in Table 17. Accept the default values unless otherwise specified. Completed the Microsoft Deployment Toolkit 2013 Setup Wizard Click Finish. Before you can use the Configuration Manager integration features of MDT, run the Configure ConfigMgr Integration wizard. This wizard copies the appropriate integration files to the folder in which Configuration Manager is installed. The wizard also adds Windows Management Instrumentation (WMI) classes for the new MDT custom actions. The classes are added by compiling a new Managed Object Format (.mof) file that contains the new class definitions. Ensure that the Configuration Manager console is closed while performing these steps. Click Start, and then point to All Programs. Point to Microsoft Deployment Toolkit, and then click Configure ConfigMgr Integration. The Configure ConfigMgr Integration Wizard starts. Complete the Configure ConfigMgr Integration Wizard using the information in Table 18. Accept the default values unless otherwise specified. Options 1. Verify that the Install the MDT console extensions for ConfigMgr 2012 check box is selected. 2. Verify that the Add the MDT task sequence actions to a ConfigMgr server check box is selected. 3. In Site server name, verify that the value is WDG-MDT-01.mdt2013.corp.woodgrovebank.com. 4. In Site code, verify that the value is NYC. The Configure ConfigMgr Integration Wizard finishes, and MDT is integrated with Configuration Manager. When you have prepared the MDT environment, create the reference computer. The reference computer is the template for deploying new images to the target computers. Configure this computer (WDG-REF-01) exactly as you will configure the target computers. You will then capture an image of the reference computer and deploy the image to the target computers. Use the Create MDT Task Sequence Wizard in the Configuration Manager console to create task sequences in Configuration Manager that are integrated with MDT. MDT includes the Standard Client Task Sequence template, which you can use to deploy the reference computer. The Create MDT Task Sequence Wizard substitutes the packages and images selected for the placeholders in the task sequence templates. After completing the wizard, the new task sequence references the appropriate packages and images. Always use the Create MDT Task Sequence Wizard to create task sequences based on the MDT task sequence templates. Although you can manually import the task sequence templates, Microsoft does not recommend this process. In the Configuration Manager console, in the navigation pane, click Software Library. In the Software Library workspace, go to Overview/Operating Systems/Task Sequences. On the Ribbon, on the Home tab, in the Task Sequences group, click Create MDT Task Sequence. The Create MDT Task Sequence Wizard starts. Complete the Create MDT Task Sequence Wizard using the information in Table 19. Accept the default values unless otherwise specified. Choose Template Select Client Task Sequence, and then click Next. Choose Template: General 1. In Task sequence name, type Windows 8.1 Reference Deployment. 2. In Task sequence comments, type Task sequence for deploying Windows 8.1 to the reference computer (WDG-REF-01), and then click Next. Choose Template: Details 1. Click Join a workgroup. 2. In Workgroup, type WORKGROUP. 3. In User name, type Woodgrove Bank Employee. 4. In Organization name, type Woodgrove Bank. 5. In Product key, type product_key (where product_key is the product key for Windows 8.1). Click This task sequence may be used to capture and image. In Capture destination, type \\WDG-MDT-01\Capture$\WDG-REF-01.wim. In Capture account, click Set. In User name, type MDT2013\Administrator. In Password and Confirm password, type P@ssw0rd. Boot Image 1. Click Create a new boot image package. 2. In Package source folder to be created, type \\WDG-MDT-01\Packages$\WINPE_Custom, and then click Next. Boot Image: General Settings 1. In Name, type Windows PE Custom. 2. In Version, type 1.00. 3. In Comments, type Customized version of Windows PE to be used in deployment of reference and target computers, and then click Next. Boot Image: Options Under Platform, click x64, and then click Next. Boot Image: Components Click Next. Boot Image: Customization Click Next. MDT Package 1. Click Create a new Microsoft Deployment Toolkit Files package. 2. In Package source folder to be created, type \\WDG-MDT-01\Packages$\MDT_Files, and then click Next. MDT Package: MDT Details 1. In Name, type MDT Files. 3. In Comments, type Provides access to MDT files during Configuration Manager deployment process, and then click Next. OS Image 1. Click Create a new OS install package. 2. In OS installation folder location, type \\WDG-MDT-01\Source$\Windows_8-1. 3. In Package source folder to be created, type \\WDG-MDT-01\Packages$\Windows_8-1, and then click Next. OS Image: Image Details 1. In Name, type Windows 8.1. 3. In Comments, type Windows 8.1 package used to deploy to reference computers, and then click Next. Client Package Click Create a new ConfigMgr client package, and then click Next. USMT Package 1. Click Create a new USMT package. 2. In Package source folder to be created, type \\WDG-MDT-01\Packages$\USMT, and then click Next. USMT Package: USMT Details 1. In Name, type USMT. 3. In Comments, type USMT files used to capture and restore user state migration information, and then click Next. Settings Package 1. Click Create a new settings package. 2. In Package source folder to be created, type \\WDG-MDT-01\Packages$\CustomSettings_Reference, and then click Next. Settings Package: Settings Details 1. In Name, type MDT Reference Computer Custom Settings. 3. In Comments, type Configuration settings for MDT deployment process (such as CustomSettings.ini) for the reference computer, and then click Next. Summary Review the information in the Details box that you provided while completing the previous wizard pages, and then click Next. The new task sequence appears in the preview pane. The Create MDT Task Sequence Wizard creates a number of packages and images. After these packages and images are created, select the distribution points from which the packages and images will be copied and available to target computers. In this sample, there is only one distribution point (WDG-MDT-01). However, most production networks have multiple distribution points. When performing this step in a production environment, select the appropriate distribution points for the network. In the preview pane, select Windows 8.1 Reference Deployment. On the Ribbon, on the Home tab, in the Deployment group, click Distribute Content. The Distribute Content Wizard starts. Complete the Distribute Content Wizard using the information in 20. Accept default values unless otherwise specified. General: Content Destination 1. Click Add, and then click Distribution Point. The Add Distribution Points dialog box appears. 2. In the Add Distribution Points dialog box, select \\WDGMDT01.mdt2013.corp.woodgrovebank.com, and then click OK.
\\WDGMDT01.mdt2013.corp.woodgrovebank.com appears in the Content destination list. Progress The progress for distributing the software is displayed. When the MDT task sequence has been created, add any device drivers required for the reference computer (WDG-REF-01) to the Windows PE boot image and to the Windows 8.1 image. Add the device drivers in the Drivers node in the Configuration Manager console. Create a package that contains the device drivers, and inject the drivers into the custom Windows PE image created earlier in the process. After creating the package that contains the device drivers, select the distribution point to which the package will be deployed. In the Software Library workspace, go to Overview/Operating Systems/Drivers. On the Ribbon, on the Home tab, in the Create group, click Import Driver. The Import New Driver Wizard starts. Complete the Import New Driver Wizard using the information in Table 21. Accept the default values unless otherwise specified. Locate Driver In Source folder, type \\WDG-MDT-01\Source$\Drivers, and then click Next. Locate Driver: Driver Details Click Next. In Name, type device_driver_name Package (where device_driver_name is a descriptive name for the device drivers). In Comment, type Device drivers that are necessary for the reference and target computers. In Driver package source, type \\WDG-MDT-01\Packages$\Drivers, and then click OK. Locate Driver: Add Driver to Boot Images 1. In the list of images, select the Windows PE Custom check box. 2. Select the Update distribution points when finished check box, and then click Next. In the Software Library workspace, go to Overview/Operating Systems/Driver Packages. In the preview pane, click device_driver_name Package (where device_driver_name is a descriptive name for the device drivers). Complete the Distribute Content Wizard using the information in Table 22. Accept the default values unless otherwise specified. 2. In the Add Distribution Points dialog box, select \\WDG-MDT-01.mdt2013.corp.woodgrovebank.com, and then click OK. Prior to deploying the reference computer (WDG-REF-01) with the task sequence bootable media, enable MDT monitoring of the ZTI deployment process. You enable monitoring on the Monitoring tab on the deployment share Properties dialog box. Later in the process, you will monitor the ZTI deployment process using the Deployment Workbench or the Get-MDTMonitorData cmdlet. Complete the New Deployment Share Wizard using the information in Table 23. When the MDT task sequence has been created, customize the MDT configuration files that provide the configuration settings for deploying Windows 8.1 to the target computer. Specifically, customize the CustomSettings.ini file. When the CustomSettings.ini file customization is finished, save the updated files to the source folder for the MDT Reference Computer Custom Settings package created earlier in the process (E:\Packages$\CustomSettings_Reference). Then, add the DoCapture and EventService properties and corresponding values to the CustomSettings.ini file so that the MDT deployment process captures an image of the reference computer (WDG-REF-01) after deploying Windows 8.1. In Windows Explorer, go to E:\Packages$\CustomSettings_Reference, and then double-click CustomSettings.ini. Ensure that you remove any additional settings other than those shown in Listing 1. Save the file, and then exit Notepad. When the source folder has been updated for the MDT Reference Computer Custom Settings package in Configuration Manager, update the distribution points for the MDT Reference Computer Custom Settings Files package. Updating the distribution points copies the updated version of the CustomSettings.ini file to the deployment shares specified in the package. In the Software Library workspace, go to Overview/Application Management/Packages. In the preview pane, click MDT Reference Computer Custom Settings. On the Ribbon, on the Home tab, in the Deployment group, click Update Distribution Points. The Configuration Manager dialog box opens, notifying you that you are going to update the package on all distribution points. In the Configuration Manager dialog box, click OK.
Configuration Manager starts updating the distribution points with the latest versions of the CustomSettings.ini file. This process could take several minutes. Check the status of the package until the Last Update value of the package status has been updated to a recent date and time. For most deployments, the Windows 8.1 Reference Deployment task sequence created earlier in the process performs all the necessary steps without modification. In this sample, modify the task sequence to set the password for the local Administrator account to a known value. By default, the task sequence sets the password for the local Administrator account to a random value. Further customization of the task sequence may be required depending on the environment. In the preview pane, click Windows 8.1 Reference Deployment. On the Ribbon, on the Home tab, in the Task Sequence group, click Edit. The Windows 8.1 Reference Deployment Task Sequence Editor dialog box opens. In the Windows 8.1 Reference Deployment Task Sequence Editor dialog box, go to PostInstall/Apply Windows Settings. Make any additional modifications to the task sequence that the environment requires, and then click OK. When you have created the task sequence to deploy Windows 8.1 to the reference computer and captured an image of the reference computer, start the task sequence. Create the operating system capture by using the Task Sequence Media Wizard in the Configuration Manager console. To deploy an operating system without stand-alone media to a new computer that Configuration Manager does not currently manage, add the new computer to the Configuration Manager site database prior to initiating the operating system deployment process. Configuration Manager can automatically discover computers on the network that have a Windows operating system installed; however, if the computer has no operating system installed, use the Import Computer Information Wizard to import the new computer information. In the Assets and Compliance workspace, go to Overview/Devices. On the Ribbon, on the Home tab, in the Create group, click Import Computer Information. The Import Computer Information Wizard starts. Complete the Import Computer Information Wizard using the information in 24. Accept the default values unless otherwise specified. Select Source Click Import single computer, and then click Next. Select Source: Single Computer 1. In Computer Name, type WDG-REF-01. 2. In MAC address, type mac_address (where mac_address is the media access control [MAC] address of the primary network adapter for the reference computer, WDG-REF-01). Select Source: Data Preview Click Next. Select Source: Choose Target Collection Click Next. Progress The progress for importing the computer is displayed. For more information on adding a new computer to the Configuration Manager site database, see the section, “To import computer information for a single computer,” in the section, “How to Deploy Operating Systems in Configuration Manager,” in the Configuration Manager Documentation Library, which is installed with Configuration Manager. In the Configuration Manager console, create a collection that includes the reference computer (WDG-REF-01). This computer collection is used later when advertising the task sequence created earlier in the process. In the Assets and Compliance workspace, go to Overview/Device Collections. On the Ribbon, on the Home tab, in the Create group, click Create, and then click Create Device Collection. The Create Device Collection Wizard starts. Complete the Create Device Collection Wizard using the information in Table 25. Accept the default values unless otherwise specified. In Name, type Microsoft Deployment – Reference Computer. In Comment, type Computer that is to be the reference computer for the target computers to be deployed. In Limited Collection, click Browse. In Name, click All Systems. Click Add Rule, and then click Direct Rule. The Create Direct Membership Rule Wizard starts. On the Search for Resources page, in Resource class, select System Resource; in Attribute name, select Name; in Value, type WDG-REF-01; and then click Next. On the Select Resources page, select WDG-REF-01, and then click Next. On the Progress page, view the progress for creating the new membership rule. Progress The progress for creating the device collection is displayed. For more information, see the section, “How to Create Collections in Configuration Manager,” in the Configuration Manager Documentation Library, which is installed with Configuration Manager. In the Configuration Manager console, deploy the task sequence created earlier in the process to the device collection that includes the reference computer created earlier in the process. On the Ribbon, on the Home tab, in the Deployment group, click Deploy. The Deploy Software Wizard starts. Complete the Deploy Software Wizard using the information in Table 26. Accept the default values unless otherwise specified. General 1. In Collection, click Browse. 2. In the Browse Collection dialog box, click Microsoft Deployment – Reference Computer, and then click OK.
3. In Comment, type Deploy Windows 8.1 to the reference computer and then capture an image of the reference computer. Deployment Settings 1. In Purpose, select Available. 2. Select the Make available to boot media and PXE check box. Deployment Settings: Schedule Click Next. Deployment Settings: User Experience Click Next. Deployment Settings: Alerts Click Next. Deployment Settings: Distribution Points Click Next. Progress The progress for deploying the task sequence is displayed. For more information, see the section, “How to Deploy a Task Sequence,” in the Configuration Manager Documentation Library, which is installed with Configuration Manager. To initiate the MDT process, provide a method for starting the computer with Windows PE and the necessary software by creating the task sequence bootable media disk. Use the Task Sequence Media Wizard in the Configuration Manager console to create bootable media for storage on a USB flash drive, CD, or DVD. On the Ribbon, on the Home tab, in the Create group, click Create Task Sequence Media. The Create Task Sequence Media Wizard starts. Complete the Create Task Sequence Media Wizard using the information in Table 27. Accept the default values unless otherwise specified. Select Media Type 1. Click Bootable media. 2. Clear the Allow unattended operating system deployment check box. Select Media Type: Media Management Click Site-based media, and then click Next. Select Media Type: Media Type In Media file, type \\WDG-MDT-01\Capture$\CM2012_TS_Boot_Media.iso, and then click Next. Select Media Type: Security In Password and Confirm password, type P@ssw0rd, and then click Next. Select Media Type: Boot Image 1. In Boot image, click Browse. 2. In the Select a Boot Image dialog box, click Windows PE Custom, and then click OK.
3. In Distribution point, click \\WDG-MDT-01.mdt2013.corp.woodgrovebank.com, and then click OK.
4. In Management point, click \\WDG-MDT-01.mdt2013.corp.woodgrovebank.com, and then click OK. Select Media Type: Customization Click Next. Progress The progress for creating the task sequence media is displayed. The wizard creates the CM2012_TS_Boot_Media.iso file in the WDG-MDT-01Capture$ shared folder. If WDG-REF-01 is a physical computer, create a CD or DVD of the International Organization for Standardization (ISO) file. If WDG-REF-01 is a VM, start the VM directly from the ISO file. For more information on creating the task sequence bootable media disk, see the section, “How to Create Bootable Media,” in the Configuration Manager Documentation Library, which is installed with Configuration Manager. Start the reference computer (WDG-REF-01) with the task sequence bootable media disk created earlier in the process. This medium starts Windows PE on the reference computer and initiates the MDT process. At the end of the MDT process, Windows 8.1 is deployed on the reference computer and an image of the reference computer is saved to \WDG-MDT-01\Capture$\WDG-REF-01.wim. You can also initiate the MDT process by starting the target computer from Windows Deployment Services. Start WDG-REF-01 with the task sequence bootable media created earlier in the process. Windows PE starts, and then the Task Sequence Wizard starts. Complete the Task Sequence Wizard using the information in Table 28. Accept the default values unless otherwise specified. Welcome to the Task Sequence Wizard In Password, type P@ssw0rd, and then click Next. Select a Task Sequence In the list box, select Windows 8.1 Reference Deployment, and then click Next. In the WDG-REF-01 Properties dialog box, on the Identity tab, view the monitoring information provided about the deployment process as described in Table 29. On WDG-MDT-01, click Start, point to Administrative Tools, and then click Windows PowerShell Modules. The Windows PowerShell Modules command prompt opens. Close the Windows PowerShell console. If any problems occur during the deployment, consult the MDT document Troubleshooting Reference. When completed, a captured image of the reference computer should exist in \\WDG-MDT-01\Capture$\WDG-REF-01.wim. After the task sequence to deploy the reference computer (WDG-REF-01) finishes, a captured image of the reference computer is stored in \\WDG-MDT-01\Capture$\WDG-REF-01.wim. Now, create a task sequence that will deploy the captured image of the reference computer to the target computer (WDG-CLI-01). When this step is complete, you can deploy the captured image of the reference computer to the target computer. After the image of the reference computer (WDG-REF-01) is captured in to the .wim file, import the captured .wim file into Configuration Manager. Import the captured .wim file into the Operating System Images node using the Add Operating System Image Wizard. The captured WIM file contains two images, one for each partition on the reference computer. Identify which of the images has the captured Windows 8.1 operating system using the image description containing Windows 8.1. You use the image index when you create the task sequence for deploying the captured image to the target computer. In the Software Library workspace, go to Overview/Operating Systems/Operating System Images. On the Ribbon, in the Create group, click Add Operating System Image. The Add Operating System Image Wizard starts. Complete the Add Operating System Image Wizard using the information in Table 30. Accept the default values unless otherwise specified. Data Source In Path, type \\WDG-MDT-01\Capture$\WDG-REF-01.wim, and then click Next. General 1. In Name, type Windows 8.1 Reference Image. 3. In Comments, type Windows 8.1 captured image of reference computer (WDG-REF-01) used to deploy to target computers, and then click Next. Progress The progress for importing the operating system image is displayed. In the preview pane, click Windows 8.1 Reference Image. In the preview pane, click the Details tab. The list of operating system partitions captured in the .wim file is displayed. The image index that contains Windows 8.1 is the image index you will specify later during the Create MDT Task Sequence Wizard. Record the image index that contains Windows 8.1. For the purposes of this example, image index 2 should have the Windows 8.1 operating system. After the image is captured, create a task sequence to deploy the captured image of the reference computer (WDG-REF-01) to the target computer (WDG-CLI-01). Most of the packages needed for this task sequence were created earlier in the process. However, you must create a new MDT Custom Settings package that has the proper configuration settings for the target computer and creates an operating system image of the captured image of the reference computer. Complete the Create MDT Task Sequence Wizard using the information in Table 31. Accept the default values unless otherwise specified. Choose Template: General 1. In Task sequence name, type UDI - Windows 8.1 Target Deployment. 2. In Task sequence comments, type Task sequence for deploying captured reference computer image to the target computer (WDG-CLI-01) using UDI, and then click Next. Choose Template: Details 1. In Use name, type Woodgrove Bank Employee. 2. In Organization name, type Woodgrove Bank. Choose Template: Capture Settings Click Next. Boot Image 1. In Specify an existing boot image package, click Browse. 2. In Select a Package dialog box, click Windows PE Custom, and then click OK.
MDT Package 1. In Specify an existing Microsoft Deployment Toolkit Files package, click Browse. 2. In the Select a Package dialog box, click MDT Files, and then click OK.
OS Image 1. Click Specify an existing OS image. 2. In Specify an existing OS image, click Browse. 3. In the Select a Package dialog box, click Windows 8.1 Reference Image, and then click OK.
OS Image: OS Image Index 1. In The selected operating system image (WIM) file contains multiple images. Specify which image you would like to deploy, select image_index (where image_index is the image index of the image that contains Windows 8.1, which was identified in the Step 5-1: Import the Captured .wim File into Configuration Manager; for the purposes of this guide, select 2). Deployment Method Click Perform a "User-Driven Installation", and then click Next. Client Package 1. In Specify an existing ConfigMgr client package, click Browse. 2. In the Select a Package dialog box, click Microsoft Configuration Manager Client Upgrade, and then click OK.
USMT Package 1. In Specify an existing USMT package, click Browse. 2. In the Select a Package dialog box, click USMT, and then click OK.
2. In Package source folder to be created, type \\WDG-MDT-01\Packages$\UDICustomSettings_Target, and then click Next. Settings Package: Settings Details 1. In Name, type UDI Target Computer Custom Settings. 3. In Comments, type Configuration settings for MDT deployment process using UDI (such as CustomSettings.ini) for the target computer, and then click Next. The list of task sequences is displayed. The task sequence that you just created (UDI – Windows 8.1 Target Deployment) is listed in the list of task sequences. Running the Create MDT Task Sequence Wizard to create the task sequence for the target generates a new software-distribution package and a new image. When the package and image are created, select the distribution points from which the package and image will be copied and available to target computers. In this sample, there is only one distribution point (WDG-MDT-01). However, most production networks will have multiple distribution points. When performing this step in a production environment, select the appropriate distribution points for the network. Select the distribution points for the software-distribution package (for the new target computer custom settings package called MDT 2013 Target Computer Custom Settings) and the operating system image package (for the new captured .wim file of the reference computer called Windows 8.1 Reference Image). In the preview pane, select UDI - Windows 8.1 Target Deployment. Complete the Distribute Content Wizard using the information in Table 32. Accept default values unless otherwise specified. When the task sequence for the target computer has been created, customize the MDT configuration files that provide the configuration settings for deploying Windows 8.1 to the target computer—specifically, CustomSettings.ini. When the CustomSettings.ini file has been customized, save the updated files to the source folder for the MDT Custom Settings package created earlier in the process (E:\Packages$\CustomSettings_Target). In Windows Explorer, go to E:\Packages$\CustomSettings_Target folder, and then double-click CustomSettings.ini. This setting configures monitoring of the target computer deployment. Make any other changes that your environment requires. When the source folder has been updated for the MDT Target Computer Custom Settings package in Configuration Manager, update the distribution points for the MDT Target Computer Custom Settings package. Updating the distribution points copies the updated version of the CustomSettings.ini file to the deployment shares specified in the package. In the preview pane, click MDT Target Computer Custom Settings. For most deployments, the Windows 8.1 Target Deployment task sequence created earlier in the process performs all the necessary steps without modification. In this sample, modify the task sequence template to set the password for the local Administrator account to a known value. (By default, the task sequence sets the password for the local Administrator account to a random value.) The task sequence may require further customization depending on the environment. In the preview pane, click UDI - Windows 8.1 Target Deployment. Create an Office Customization Tool (OCT) Setup customization file (.msp file). For more information about each of these methods, see Customize Setup before installing Office 2010. For the purposes of this guide, the unattended installation of Office Professional Plus 2010 will be done by creating an OCT Setup customization file (.msp file). You will save the OCT Setup customization file in the Updates folder, which is automatically scanned by the Office Professional Plus 2010 Setup Wizard. At a command prompt, type the following command, and then press ENTER. The OCT starts, and the Select Product dialog box opens. In the OCT, in the Select Product dialog box, click OK. The OCT loads the appropriate information, and then displays the settings that can be customized in the .msp file. In the OCT, in the navigation pane, go to Setup/Install location and organization name. In the preview pane, in Organization name, type Woodgrove Bank. In the OCT, in the navigation pane, go to Setup/Licensing and user interface. In the preview pane, select the I accept the terms in the License Agreement check box. In the preview pane, in Display level, select None. In the Save As dialog box, type E:\Source$\OfficeProPlus2010\Updates\OPP2010_Unattend, and then click Save. The OPP2010_Unattend.msp file is saved. One of the advantages to performing MDT deployments using UDI is the ability for the user to select the applications to install at deployment time. You can add any number of applications to Configuration Manager, and then select the applications when running the UDI Wizard, as described in Step 6-4: Start the Target Computer with the Task Sequence Bootable Media. You can configure the applications that appear in the UDI Wizard using the UDI Wizard Designer, as described in Step 5-11: Customize the UDI Wizard Configuration File for the Target Computer. In the Software Library workspace, go to Overview/Application Management/Applications. On the Ribbon, on the Home tab, in the Create group, click Create Application. The Create Application Wizard starts. Complete the Create Application Wizard using the information in Table 33. Accept default values unless otherwise specified. General Click Manually specify the application information, and then click Next. General: General 1. In Name, type Microsoft Office Professional Plus 2010 – x86. 2. In Administrator comments, type 32-bit version of Microsoft Office Professional Plus 2010. 3. Select the Allow this application to be installed from Install Application task sequence action instead of deploying it manually check box. General: Application Catalog 1. In Localized description, type 32-bit version of Microsoft Office Professional Plus 2010 for use by Woodgrove Bank Employees. 2. In Keywords, type Office Professional Plus 2010. The Create Deployment Type Wizard Starts. In the Create Deployment Type Wizard, on the General page, click Manually specify the deployment type information and then click Next. In Name, type Microsoft Office Professional Plus 2010 – x32 (Windows Installer). In Administrator comments, type Deploy Microsoft Office Professional Plus 2010 using native Windows Installer. In Content location, type \\WDGMDT01\Source$\OfficeProPlus2010. In Installation program, type setup.exe. In Uninstall program, type setup.exe /uninstall PROPLUS. The Detection Rule dialog box appears. In the Detection Rule dialog box, in Setting Type, select Windows Installer. In the Open dialog box, in File name, type \\WDGMDT01\Source$\OfficeProPlus2010\ProPlus.WW\ProPlusWW.msi, and then click Open. The product code for Office Professional Plus 2010 appears in the Product code box. In the Detection Rule dialog box, click OK. In Installation behavior, select Install for system. In Logon requirement, select Whether or not a user is logged on. In Installation program visibility, select Normal. In Estimated installation time, type 120. On the Requirements page, click Next. On the Dependencies page, click Next. Progress The progress for creating the application is displayed. The Office Professional Plus 2010 – x86 application appears in the preview pane. After you have created the Office Professional Plus 2010 application, you need to distribute the application to the distribution points. Doing so allows installation of the application from the distribution points. For the purposes of this guide, there is only one distribution point (WDG-MDT-01). In typical Configuration Manager deployments, there are usually multiple distribution points. In the preview pane, click Microsoft Office Professional Plus 2012 – x86. Complete the Distribute Content Wizard using the information in Table 34. Accept the default values unless otherwise specified. Progress The progress for distributing the application is displayed. In the preview pane, click Microsoft Office Professional Plus 2010 – x86. Complete the Deploy Software Wizard using the information in Table 35. Accept the default values unless otherwise specified. The Select Collection dialog box appears. 2. In the Select Collection dialog box, click All Users, and then click OK.
3. In Comments, type Make Microsoft Office Professional Plus 2010 available for deployment to all users. Progress The progress for deploying the application is displayed. The User-Driven Installation task sequence template includes a task sequence step that runs the UDI Wizard. When a task sequence step runs the UDI Wizard, the step also references an XML file that determines the configuration of the UDI Wizard. The UDIWizard_Config.xml file in the Scripts folder controls the behavior of the UDI Wizard. Customize the UDIWizard_Config.xml file using the UDI Wizard Designer. The UDI Wizard Designer includes predefined stage groups for the UDI Wizard listed in Table 36. You can add or remove the wizard pages that appear in the UDI Wizard and the sequence of each wizard page for each stage group. New Computer Use this stage group as the basis for your deployment when a new installation of a Windows operating system is deployed to a new computer and no user state is migrated. Refresh Use this stage group as the basis for your deployment when a computer is refreshed, including computers that must be re-imaged for image standardization or to address a problem. Replace Use this stage group as the basis for your deployment when one computer replaces another computer. The existing user state migration data is saved from the original computer. Then, a new installation of Windows is deployed to a new computer. Finally, the user state data is restored to the new computer. Click Start, point to All Programs, point to Microsoft Deployment Toolkit, and then click UDI Wizard Designer. The UDI Wizard Designer starts. On the Ribbon, on the Home tab, in the File Menu group, click Open. In the Open dialog box, in File name, type \\WDG-MDT-01\Packages$\MDT_Files\Scripts\UDIWizard_Config.xml, and then click Open. This opens the copy of the UDIWizard_Config.xml file that resides in the MDT Package folder you created when you ran the Create Microsoft Deployment Task Sequence Wizard earlier in the process. In the Page Library, click Install Programs. On the Ribbon, on the Home tab, in the Edit Settings group, click Configuration Manager. The Site Settings dialog box appears. In Site Server Name, type WDG-MDT-01. In Site Code, type NYC. In Application Collection, type All Users. The Configuration Manager collection you type here must match the Configuration Manager collection to which you deployed your applications. In this guide, you selected the All Users collection in Step 5-10: Make the Office Professional Plus 2010 Application Available to All Users. In the preview pane, on the Flow tab, expand StageGroup: New Computer. The list of wizard pages used in the StageGroup: New Computer flow is displayed. Make note of the sequence of the wizard pages in the StageGroup: New Computer flow in the UDI Wizard Designer. You will see the same sequence of wizard pages when you run the UDI Wizard in Step 6-4: Start the Target Computer with the Task Sequence Bootable Media. Configure the StageGroup: New Computer flow using the information for each page listed in Table 37. Accept the default values unless otherwise specified. Under BitLocker Mode, expand BitLocker Mode. In BitLocker Checkbox, clear the Initially check this check box check box. The status for each configuration option changes to Locked, which prevents users from changing these options in the UDI Wizard. Under Image Combo Box, expand Image Combo Behavior, under Image Combo Box Values, right-click Windows 8.1 RTM (x86), and then cliczk Select an Operating System Image. The Select an Operating System Image dialog box appears. In Select an Operating System Image/Installer to add, click image_index (where image_index is the image index of the image that contains Windows 8.1, which was identified in Step 5-1: Import the Captured .wim File into Configuration Manager; for the purposes of this guide, select 2). In Display Name, type Windows 8.1 Reference Image – x64. Under Image Combo Box, expand Image Combo Behavior; under Image Combo Box Values, right-click Windows 8.1 RTM (x86), and then click Remove Item. The Delete Item Confirmation dialog box appears. In the Delete Item Confirmation dialog box, click Yes. Under User Data and Settings, expand User Data Combo Behavior, and then select the Format: Clean all the data on the target volume during install check box. New Computer Details 1. Under Network Details, expand Network Details; in Domain or Workgroup Radio Buttons, click Domain. 2. Under Domain or Workgroup Radio Buttons, click Unlocked. The status changes to Locked, which prevents users from changing this option in the UDI Wizard. 3. Under Network Details, expand Domains and OUs, and then click Add Domain. The Create or Edit Domain Information dialog box appears. 4. In the Create or Edit Domain Information dialog box, in Domain Name type mdt2013.corp.woodgrovebank.com. 5. In the Create or Edit Domain Information dialog box, in Friendly Name, type Woodgrove Bank Active Directory Domain, and then click OK. Under Software and Groups, right-click any blank area, and then click Add Software Group. The Add/Edit a Software Group dialog box appears. In the Add/Edit a Software Group dialog box, in Name, type Woodgrove Bank Applications, and then click OK. Under Software and Groups, click Woodgrove Bank Applications. On the Ribbon, on the Home tab, in the General Software Item Settings group, click Add, and then click Add Software to Group. The Add Software to Group Wizard starts. On the What type of software item do you want to add page, click I want to add an Application, and then click Next. On the Search Configuration Manager for the Software Item to Add page, in Display Name, type Microsoft Office Professional Plus 2010 – x86. On the Search Configuration Manager for the Software Item to Add page, click Select. The Search Applications dialog box appears. In the Search Applications dialog box, click Search, click Microsoft Office Professional Plus 2010 – X86, and then click OK.
On the Search Configuration Manager for the Software Item to Add page, click Finish. Microsoft Office Professional Plus 2010 – x86 appears underneath the Woodgrove Bank Applications software group. Under Software and Groups, click General Software. On the Ribbon, on the Home tab, in the General Software Item Settings group, click Add, and then click Remove Item. The Delete the Selected Item dialog box appears. In the Delete the Selected Item dialog box, click Yes. Under Software and Groups, select the check box for Woodgrove Bank Applications. The group and Microsoft Office Professional Plus 2010 – x86 are selected. On the Ribbon, on the Home tab, click Save. The File Save dialog box appears. In the File Save dialog box, click OK.
Leave the UDI Wizard Designer open for the next step. You can create custom wizard pages that allow you to collect deployment information in addition to the information collected on other UDI Wizard pages. You create custom wizard pages based on the Build Your Own Page wizard page type. After you create the custom wizard page, you can add controls to it and configure the task sequence variables the controls set. For this guide, Woodgrove Bank wants to allow users to enter their name and the department in which they work. Woodgrove Bank is departmentalized by geographic location. This information will be used to configure the registered user name and organization in Windows. In this step, you add a new custom wizard page to the New Computer stage group. On the Ribbon, on the Home tab, in the Page Library group, click Add Page.The Add New Page dialog box appears. In the Add New Page dialog box, in the Page Type column, click Build Your Own Page. In Display Name, type User Information. In Page Name, type UserInformationPage, and then click OK. The User Information page appears in the Page Library. In the details pane, click the Flow tab. On the Flow tab, expand the New Computer stage group. The list of wizard pages in the New Computer stage group is displayed. In the Page Library, drag the User Information page to a point immediately before the BitLocker page in the New Computer stage group on the Flow tab. After the new UDI custom wizard page has been added to the New Computer stage group, the appropriate controls need to be added to the new custom wizard page. The controls are added to the custom wizard page from the Build Your Own Page toolbox, which is displayed when you view the custom wizard page on the Configure tab in the UDI Wizard Designer. Table 38 lists the types of controls to your custom wizard page, which is illustrated in Figure 1. Checkbox This control allows you to select or clear a configuration option and behaves as a traditional user interface (UI) check box. This control has a corresponding label that you can use to describe the purpose of the check box. The state of this control is True when the check box is selected and False when the check box is cleared. The state of the check box is stored in the task sequence variable configured for this control. For more information on this control, see "Checkbox Control" in the MDT document, Toolkit Reference. Combobox This control allows you to select an item from a list of items and behaves as a traditional UI drop-down list. This control allows you to add or remove items from the list and provide a corresponding value that will be set in the task sequence variable configured for this control. For more information on this control, see "Combobox Control" in the MDT document, Toolkit Reference. Line This control allows you to add a horizontal line to divide one portion of the custom wizard page from another. This control does not collect any configuration values but rather is used to visually enhance the UI. For more information on this control, see "Line Control" in the MDT document, Toolkit Reference. Label This control allows you to add descriptive, read-only text to the wizard page. This control does not collect any configuration values but rather is used to visually enhance the UI. For more information on this control, see "Label Control" in the MDT document, Toolkit Reference. Radio This control allows you to select one configuration option from a group of two or more options. As with traditional radio buttons, two or more of these controls can be grouped together, and then the user can select one of the options in the radio button group. A unique value is assigned to each option. The value assigned to the selected option control is saved in the task sequence variable configured for this control. For more information on this control, see "Radio Control" in the MDT document, Toolkit Reference. Bitmap This control allows you to add a bitmap graphic (.bmp file) to the custom wizard page. This control does not collect any configuration values but rather is used to visually enhance the UI. The path to the .bmp file is relative to the location of the UDI Wizard (OSDSetupWizard.exe). For more information on this control, see "Bitmap Control" in the MDT document, Toolkit Reference. Textbox This control allows you to enter text on the custom wizard page. The text typed into this control is saved in the task sequence variable configured for this control. For more information on this control, see "Textbox Control" in the MDT document, Toolkit Reference. You can add any combination of these controls to your custom wizard page based on the information you want to collect. In addition, you can use the Show Gridlines check box to show or hide gridlines that can be used to assist in visually designing the custom wizard page. For the purposes of this example, you will create a custom wizard page as illustrated in Figure 1. In the Page Library, click User Information page. In the details pane, click the Configure tab. The Build Your Own Page toolbox and empty wizard page are displayed. The label control is placed on the wizard page and named label1. On the custom wizard page, click label1 (the label control added in step 3). This control acts as a heading for the custom wizard page and describes the purpose of the page. Configure the layout properties of label1 on the Layout tab using the information in Table 39. Accept the default values unless otherwise stated. The label control is placed on the wizard page and named label2. On the custom wizard page, click label2 (the control added in the previous step). This control acts as a label for the text box used to enter the user name. Configure the layout properties of label2 on the Layout tab using the information in Table 40. Accept the default values unless otherwise stated. The Textbox control is placed on the wizard page and named text1. On the custom wizard page, click text1 (the control added in the previous step). This control is the text box used to enter the user name. Configure the layout properties of text1 on the Layout tab using the information in Table 41. Accept the default values unless otherwise stated. Configure the settings properties of text1 on the Settings tab using the information in Table 42. Accept the default values unless otherwise stated. The Label control is placed on the wizard page and named label3. On the custom wizard page, click label3 (the control added in the previous step). This control acts as a label for the combo box used to select the organization or department name for the user. Configure the layout properties of lable3 on the Layout tab using the information in Table 43. Accept the default values unless otherwise stated. The Combobox control is placed on the wizard page and named combo1. On the custom wizard page, click combo1 (the control added in the previous step). This control is the combo box used to select the organization name. Configure the layout properties of combo1 on the Layout tab using the information in Table 44. Accept the default values unless otherwise stated. Add data items to the layout properties of combo1 on the Layout tab using the information in Table 45. Accept the default values unless otherwise stated. Configure the settings properties of combo1 on the Settings tab using the information in Table 46. Accept the default values unless otherwise stated. Close the UDI Wizard Designer. After the UDI Wizard configuration file, UDIWizard_Config.xml, has been updated for the MDT Files package in Configuration Manager, update the distribution points for the MDT Files package. Updating the distribution points copies the updated version of the UDIWizard_Config.xml file to the deployment shares specified in the package. In the preview pane, click MDT Files. Configuration Manager starts updating the distribution points with the latest versions of the UDIWizard_Config.xml file. This process could take several minutes. Check the status of the package until the Last Update value of the package status has been updated to a recent date and time. When you have captured the image of the reference computer and created and configured the task sequence, deploy the captured image. Configure MDT to provide all the necessary configuration settings to deploy to the target computer. After initiating the deployment process, the image of the reference computer running Windows 8.1 is automatically deployed to the target computer and configured with the settings defined. Complete the Import Computer Information Wizard using the information in Table 47. Accept the default values unless otherwise specified. Select Source: Single Computer 1. In Computer Name, type WDG-CLI-01. 2. In MAC address, type mac_address (where mac_address is the MAC address of the primary network adapter for the target computer, WDG-CLI-01). In the Configuration Manager console, create a collection that includes the target computer (WDG-CLI-01). You use this computer collection later when advertising the task sequence created earlier in the process. On the Ribbon, on the Home tab, in the Create group, click Create Device Collection. Complete the Create Device Collection Wizard using the information in Table 48. Accept the default values unless otherwise specified. In Name, type Microsoft Deployment – Batch 01. In Comment, type Computers that are to be included in the first batch of computers deployed. In the Browse Collection dialog box, in Name, click All Systems. On the Search for Resources page, in Resource class, select System Resource; in Attribute name, select Name; in Value, type WDG-CLI-01; and then click Next. On the Select Resources page, select WDG-CLI-01, and then click Next. Note: The process for adding the target computer (WDG-CLI-01) to All Systems can take a few minutes to finish. If WDG-CLI-01 does not appear in the list, repeat steps b and c until WDGCLI01 appears. In the Configuration Manager console, deploy the task sequence created earlier in the process for the target computers. Deploy the task sequence to the collection of target computers created earlier in the process. Complete the Deploy Software Wizard using the information in Table 49. Accept the default values unless otherwise specified. 2. In the Browse Collection dialog box, click Microsoft Deployment – Batch 01, and then click OK.
3. In Comment, type Deploy Windows 8.1 to the first batch of target computers using UDI. Progress The progress for creating the deploying the task sequence is displayed. Start the target computer (WDG-CLI-01) with the task sequence bootable media created earlier in the process. This medium starts Windows PE on the reference computer and initiates the MDT process. At the end of the MDT process, Windows 8.1 is deployed on the target computer. Start WDG-CLI-01 with the task sequence bootable media created earlier in the process. Complete the Task Sequence Wizard using the information in Table 50. Accept the default values unless otherwise specified. Select a Task Sequence In the list box, select UDI - Windows 8.1 Target Deployment, and then click Next. At the appropriate task sequence step, the UDI Deployment Wizard starts. Complete the UDI Deployment Wizard using the information in Table 51. Accept the default values unless otherwise specified. User Information 1. In User Name, type Woodgrove Bank Chicago Employee. 2. In Organization or Department Name, select Woodgrove Bank – Chicago. Deployment Readiness 1. Review the configuration checks, and ensure that the status for all checks are set to Success. New Computer Details 1. In Computer name, type WDG-CLI-01. Note: In unknown computer scenarios, users could change the computer name to the appropriate value. 2. In User name, type MDT2013\Administrator. 3. In Password and Confirm password, type P@ssw0rd. Administrator Password 1. In Administrator password and Confirm password, type P@ssw0rd. User Device Affinity Select the Set primary user check box, and then click Next. Install Programs Verify that the Microsoft Office Professional Plus 2010 – x86 check box is selected, and then click Next. Summary Review the information that you provided while completing the previous wizard pages, and then click Finish. In the WDG-REF-01 Properties dialog box, on the Identity tab, view the monitoring information provided about the deployment process as described in Table 52. DaRT Remote Control This button allows you to establish a remote control session using the remote viewer feature in DaRT. If any problems occur during the deployment, consult the MDT document Troubleshooting Reference. When successfully completed, the target computer is running a Windows 8.1 operating system configured like the reference computer. At the completion of the deployment process, Windows 8.1 starts for the first time, and the Welcome tab in the Deployment Complete dialog box is displayed. The Welcome tab displays helpful information about the deployment and provides contact information in the event issues with the deployment occur. Review the information on the Deployment Summary and Applications Installed tabs to verify that Windows 8.1 and Office Professional Plus 2010 were installed correctly. When you have finished reviewing these tables, click Start Windows to log on to Windows 8.1 for the first time. Configuration Manager applications are not displayed on the Applications Installed tab. Instead, they are detected after the user logs on to the target computer for the first time.